So who are these giants of the digital travel world, how have they captured the hearts and minds of the holiday booking public, and what can you do to secure your own slice of the online bookings pie? Here we take a closer look at two online booking megabrands. One of the world’s most popular booking websites is booking.com, which claims to provide access to more than 600,000 holiday properties globally. Perhaps part of the brand’s success is its single-minded focus on what it offers its customers – bookings (it’s right there in the domain name). The brand has rather shrewdly aligned itself with the concept of booking a holiday itself, and in doing so made a bid to become synonymous with the action. 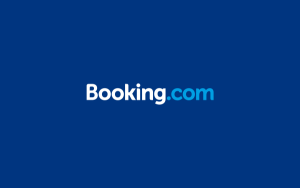 On first glance at booking.com you’ll find little about the brand itself – the website is more or less given over to the process of finding and booking a holiday in virtually any global destination. This in itself reveals part of the brand story – the company is committed to forefronting a huge range of choice and making it easy to make a booking online. The first statistic tells prospective customers that the company are trusted and popular, while the second puts some exact figures to the range of holidays available. The third tells them that there is a large network of people behind the brand, rather than just a faceless website. Also on the about us page, and throughout the website, it is suggested that beyond the level of choice and popularity of the site, it also offers the ‘best available rates’, that no reservation fees are necessary, and that booking is entirely secure. In doing all of this, the firm aligns its brand identity with the things that its customers are most looking for – choice, value and trustworthiness. Lastminute.com is of a similar ilk to booking.com in that it aims to offer a wide selection of bookings to a wide variety of people, with accommodation, flights and events around the world. But to distinguish itself and its brand story from the competition, the booking website has placed its marketing focus squarely on its ability to get customers heavily discounted deals. Again, this core brand trait is present right at the root of its online identity – its domain name. In those few lines, the company expresses the philosophy behind its brand and does so in compelling story form. Bringing the founder’s original intentions into the picture also gives the brand a more human element that people can relate to. What both successful brands have in common is that they have clearly identified what their brand story is, and they have communicated it subtly but distinctly throughout the flow of their content. If your travel firm needs help doing the same, get in touch with Big Star Copywriting, and our star copywriters will put the story into your content. ← Does an online brand story really need a good enemy?